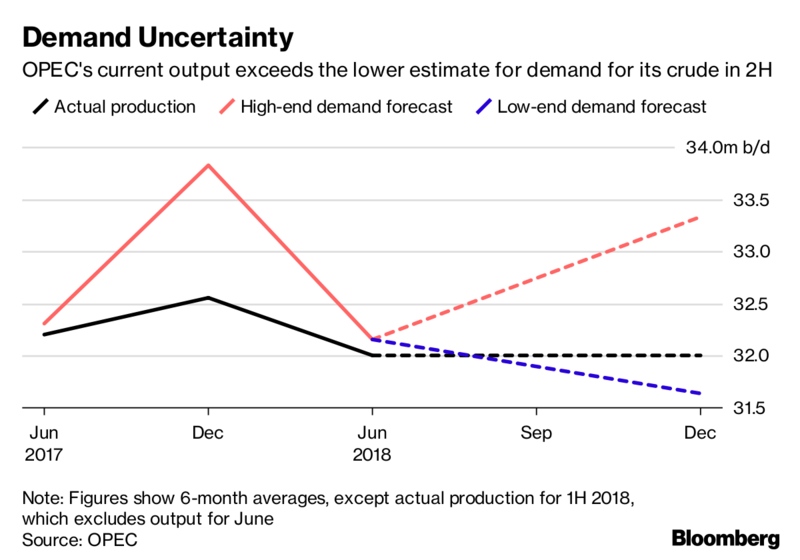 OPEC emphasized the deep uncertainty over the strength of demand for its oil just a week before contentious talks on whether to raise production. There’s a “wide forecast range” for how much crude the Organization of Petroleum Exporting Countries needs to pump in the second half of the year, its research department said in a monthly report. With a range of uncertainty of 1.7 million barrels a day, demand could either be significantly higher, or slightly lower, than OPEC’s current output. OPEC and its allies will debate whether to revive halted output when they gather in Vienna next week. Saudi Arabia and Russia have said they want to raise supplies to prevent high prices hurting economic growth, but opposition among other producers is growing. The cartel’s main forecast, mostly unchanged from last month’s report, indicates that more of its crude would be needed to fully satisfy global demand. However, the group also gave unusual emphasis to the uncertainty in this estimate. An average of 33.34 million barrels a day is required from the group’s 14 members in the second half of 2018, considerably higher than the 31.87 million they pumped last month, the report showed. Output from Venezuela continues to slump amid an economic crisis, slipping to 1.39 million barrels a day in May. Yet the report also said that “downside risks might limit” the demand outlook as economic growth slows in major economies, fuel subsidies are withdrawn and consumers switch from oil to natural gas. It also highlighted the potential for even faster output growth from rival producers including the U.S., Canada and Brazil. OPEC uses the top end of the forecast range for its base-case estimate, the report showed. If demand for its crude turns out to be at the lower end, OPEC’s current output would already be slightly higher than the market requires. Despite the uncertainties, Saudi Arabia and Russia appear to already be in the process of increasing production, unwinding almost 18 months of supply restraint. Saudi Arabia told the organization it had raised output above 10 million barrels a day last month for the first time since October, the report showed. Russia boosted crude supply to the highest in 14 months in the first week of June as some companies breached their caps, said a person with knowledge of the matter.